A clinical trial's first-in-human implant seeks to determine whether brain stimulation can help restore motor function in stroke survivors. Surgeons at Cleveland Clinic have performed the first deep-brain stimulation (DBS) surgery to improve stroke recovery in humans. The six-hour procedure, conducted December 19, was part of a clinical trial using Boston Scientific's Vercise DBS system, which is also being studied in a U.S. trial for Parkinson's disease. A team led by Andre Machado, MD, PhD, chairman of Cleveland Clinic's Neurological Institute, implanted electrodes in the patient's cerebellum, which has extensive connections with the cerebral cortex. Connected to a pacemaker, DBS electrodes provide small electric pulses to help people recover control of their movements. The surgery represents the first time DBS will be used to mitigate paralysis brought on by stroke, the leading cause of long-term disabilities in the United States. Despite rehabilitation, one-third of stroke patients maintain long-term motor deficits severe enough to be disabling, according to a statement by Cleveland Clinic. "We are evaluating the effects of therapy in patients who continue to have severe unilateral, or one-sided, weakness of the arm 12 to 24 months after their stroke," said Kenneth Baker, PhD, co-primary investigator and a member of the clinic's neuroscience department. "Although the primary endpoints related to this phase I trial revolve around the safety and feasibility of the treatment, the team will be monitoring the patient using an array of tests that are sensitive to changes in arm and hand strength and function." The patient has been discharged in stable condition and will have physical therapy for a few weeks before the DBS device is turned on. "About three months after the implant procedure we will begin to titrate stimulation, meaning that we will systematically evaluate the acute, or immediate, effects of turning stimulation on at different intensities of stimulation across different contacts along the electrode," Baker said in an email. "Once we have completed this process, we will turn the stimulator on chronically beginning on approximately the fourth month following implantation." DBS can help the brain reorganize and adapt beyond what physical therapy alone can do, according to Machado, who patented the DBS method in stroke recovery. If this research succeeds, it represents an opportunity to allow patients who remain paralyzed after a stroke to gain function and independence, he said in the statement. "We expect the results of this early feasibility study to provide information on which to base decisions regarding how best to design and conduct future trials that will emphasize efficacy and outcomes," Baker added in the email. "Overall, of course, our hope is that the therapy is able to provide a renewed opportunity to achieve meaningful improvements in motor function for those patients who lives continue to be impacted by motor deficits months or even years following their stroke." The researchers hope to gain further insight into DBS' therapeutic mechanisms and into improving delivery of therapy, Baker said. Don't miss MD&M West in Anaheim, February 7-9, 2017. Machado's previous research has shown that DBS targeting the same brain pathway in a laboratory model promotes the brain's ability to form new neural connections during recovery from stroke. This clinical trial expands on that work and for the first time translates it to humans. Cleveland Clinic Innovations established a spin-off company, Enspire DBS Therapy, to fund the clinical trial and commercialize the method. 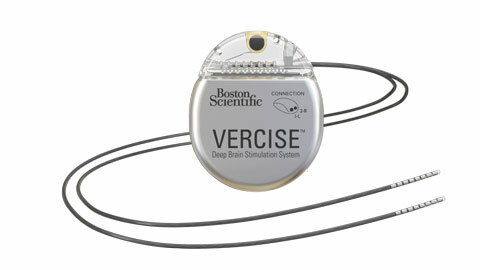 Boston Scientific recently invested $2.5 million in Enspire DBS. Vercise is in use in Europe for indications including Parkinson's disease, essential tremor, and primary and secondary dystonia. It has not been approved by FDA, but management commentary on Boston Scientific's third-quarter 2016 earnings call reiterated a U.S. launch for Vercise in late 2017.